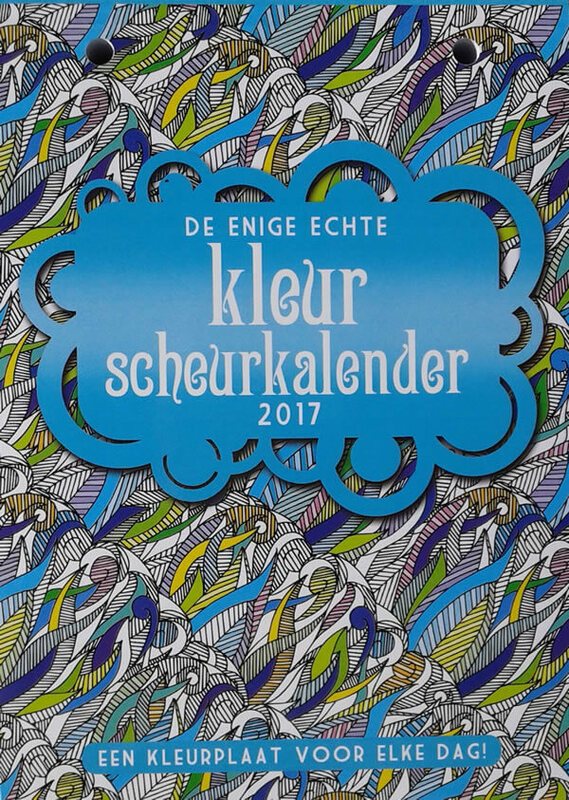 Through Kleuren voor Volwassenen (Coloring for adults) I received from BBNC Publishers their Dutch ‘De Enige Echte Kleurscheurkalender 2017’. Translated in English it would be ‘The One and Only Coloring Block Calendar 2017’. First I’d like to share my appreciation and gratitude for this calendar. I had the previous one for 2016, so I’m very pleased that I’ve already got the new one for next year. Loads of designs to color! This calendar measures 18 x 13 x 4,7 centimeters. Especially the thickness is something I had to get used to, since I’m not able to support my hand while coloring. The paper was also something to get used to. The quality is fine, the paper is white and coloring on it goes swell. Very different that for example the normal block calendars that are (at least in the Netherlands) usually printed on very thin, brownish, fibrous, recycled paper. The only thing is that the paper of this coloring block calendar is quite thin. But hey, I already figured that when BBNC had decided to use thicker paper, and then 365 sheets, you’d have to use a wedge-bolt anchor to be able to carry that weight 😀 . Now it already weighs 865 grams! So under the guise of ‘one can get used to everything’, I’ll accept the thin paper. Be my guest and watch the video that I’ve made from the calendar. 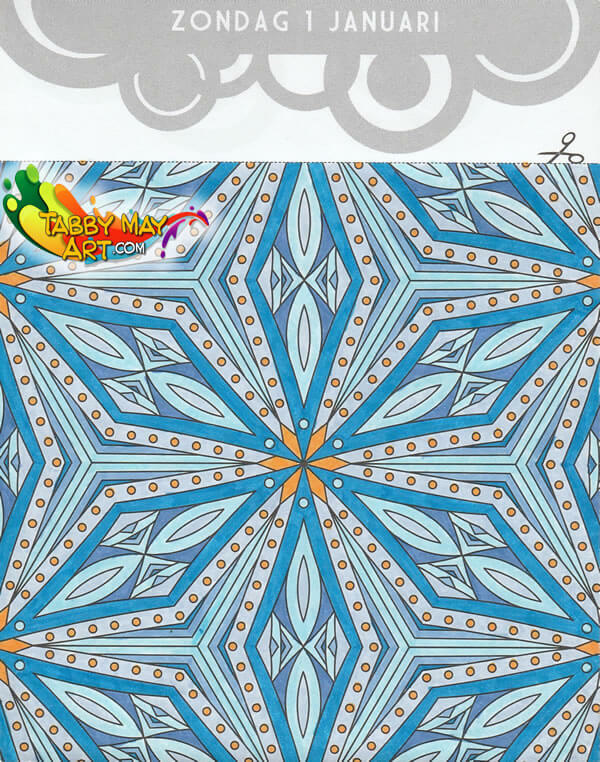 For this review I’ve colored four designs. It didn’t take much to pick a couple, since I’ve just started with January 1st and went on till January 4th. With the last one things went a bit wrong, not according plan, but I’ll tell more about that later on! 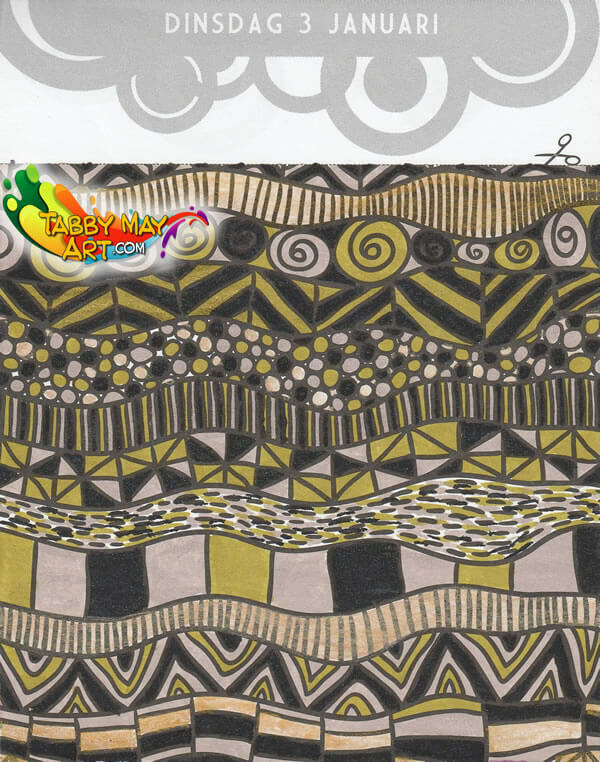 The first design was colored with Faber Castell Pitt Brush pens. Gosh, how I love these pens! And the combination with this paper is really nice. Too bad the paper started to curl a bit when I had finished this sheet. Maybe I’ll need to iron it (with a sheet of paper underneath), to smoothen it again, since the weight of the calendar didn’t help. It wasn’t heavy enough to straighten the paper again. To colorize the second one, logically January 2nd, I’ve used the Faber Castell Pitt Brush pens again. Thanks to the brush the small details can be colored as well. I love it! And then I already reached number three. Last week I received a set of gold glitter, silver glitter and black glitter Spectrum Noir Sparkle brush markers. Those Facebook groups are really ‘bad’ for me. I see nice new things all the time and every time I want to try them out myself… but okay, let’s call that ‘inspiration’ haha 😉 . I had also received the Gansai Tambi glitter watercolor in several shades of gold, so I’ve colored one of the designs completely with glitters. On the scan it’s a bit hard to see, unfortunately. In real life, especially with good light, the shimmers and glitters are very good visible. Just wonderful! So I want to use that more often, but not on complete designs. More for accents and highlights. But now was very convenient to test those materials a bit and learn how to use them. And I got quite a good idea about the effect of the markers on the paper, since the Sparkle markers are pretty wet. But the paper didn’t bother. Beside a bit of curling, like it did with the Pitt Brushes too, the liquid didn’t do any harm. And that was much better than I had expected. 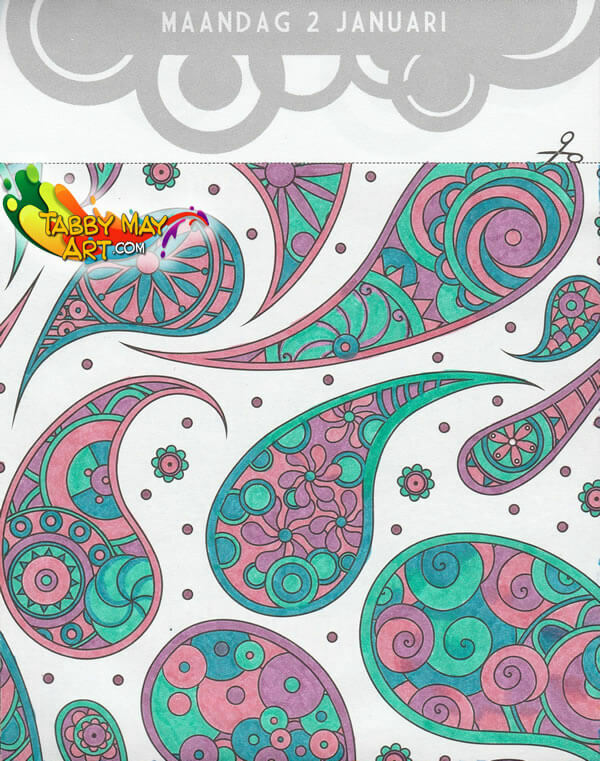 Finally I had planned a fourth sheet from the coloring block calendar. And that would’ve been no problem at all, if I hadn’t made the choice to use the Marco Renoir colored pencils. And boy they were a disaster. Really terrible! The cores pulverized with the slightest bit of pressure. One after another… *bang*… there they went… All I could do was sharpen them, continuously. I’ve made a video of it and wrote a blogpost about this. In the meantime I’ve opened a dispute with the seller and asked for a refund. You can probably imagine that I didn’t want to finish that fourth sheet. I was SO annoyed and couldn’t motivate myself to finish it with another brand of pencils, but I will. Some other time! All in all I really like the drawings in the One and Only Coloring Block Calendar 2017. 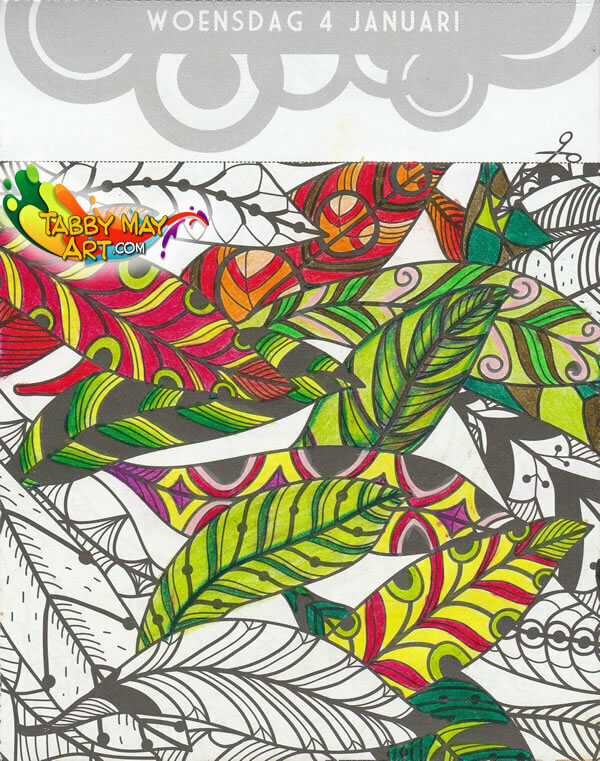 There’s plenty of variety, and guaranteed 365 times of good coloring. The size of the designs is pleasurable. 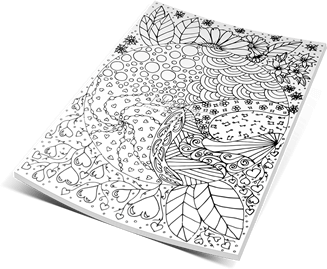 Not too large, so it’s fairly easy to color one a day (and keep the stress away 😀 ). All pictures from this review can be seen here, or through the Photo gallery in the top menu. Share this review on Facebook and Twitter if you like it. Thanks in advance! Note: This review contains products that I received from a publisher or company. This however does not reflect on my opinion in any way.